Updated blog post with two new pictures that were since acquired, showing this now extinct locomotive in action… Enjoy! 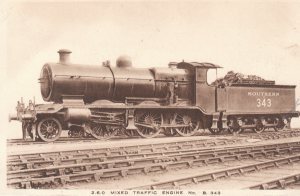 Having picked up a Southern Railway postcard at Medstead and Four Marks, I decided to look into the locomotive type illustrated on it – a locomotive from a now extinct class. Since then, another couple of pictures have been added to this blog post below. The picture’s show Southern railway no B343 (above), B341 (below) and 2345 plus examples of the London Brighton and South Coast Railway’s (LBSCR) K class. It is a great shame that no K class locomotives survived, as they were a significant type in the history of railways of southern England.